UOForums conducted a wonderful interview of the PaxLair Community on January 10, 2007. The interview talked about the history of PaxLair and its future. The interview is now published on the great UOForums service. 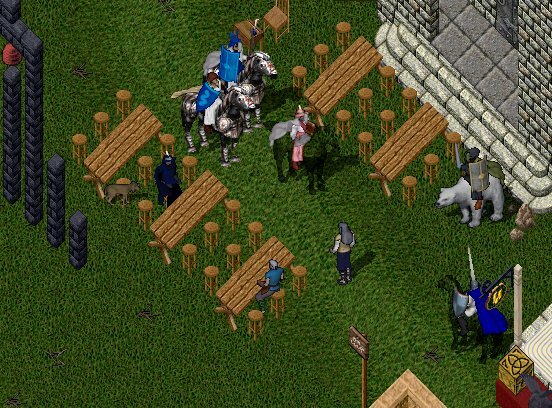 The interview was conducted in the Realm where several people came from UOForums to visit Dragons Watch Tavern. At the Tavern, PaxLair had Mayor Winfield, Viceroy NANOC and Deputy Viceroy Phoenix (Dragons Watch), Viceroy DutchessVanHorn (PaxLair City), Knight Monk, Tempest of Skye, and John Duke. From UOForums or other visitors were Queen Mum, Se'an Silvergoot, Eowyna, George, Snuggs, Rabith Vishad, Cabe Bedlam, and Rascal. The UOForums Interview is here. Excellent. A true tribute to what UO has always been about in my minds eye. But players coming together to use all of the above to make "community". The game can provide the tools, it's the players that provide the unique experience that keeps one wanting to come back. Well done Paxlair, and Thanks Queen Mum for the interview! PaxLair sincerely thanks UOForums' Queen Mum for coming to PaxLair on Chesapeake! It is not often that the citizens of PaxLair can meet and entertain such notable guests. 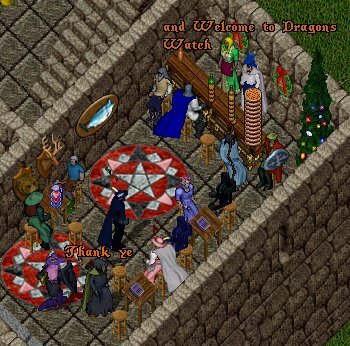 UOForums is an official Fan Site of Ultima Online and provides great messageboard services for shards, guilds, the entire UO community, and many special interest areas. Visit UOForums often!